Gaines, on Brains: Ecstasy: "Safe"? Call me a prude, but I'm not so thrilled about the announcement made yesterday by British Columbia's top health official that ecstasy is "safe." Ecstasy, best known for its recreational use among the "rave" scene, can induce euphoria, diminished anxiety, and a sense of intimacy with others. Remember those old "Just Say No" PSAs from the late '80s championed by First Lady Nancy Reagan? "This is drugs." An egg cracks into a sizzling skillet. "This is your brain on drugs. Any questions?" The commercials were short, memorable, and got the point across, albeit lacking scientific support. Who cares about the science with such a powerful visual, anyway? How's this for a scientific visual: in 1999, the Journal of Neuroscience published a study by Johns Hopkins researchers examining the effects of short-term MDMA use on the brain over the long-term. In other words, can a single weekend of hard partying result in deficits years down the road? Hatzidimitriou and colleagues injected 5 mg/kg MDMA (pure MDMA—just as Dr. Kendall assures is "safe") in squirrel monkeys subcutaneously twice a day for four days. That's about the equivalent of an average 150 lb. person consuming 3 ecstasy tablets per day. 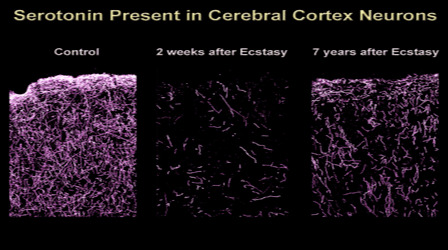 Two weeks after just four days of ecstasy use, there is a highly significant reduction of serotonergic neurons in the cortex (middle panel) compared to control. Terrifying, right? It gets worse. Just look at the effects after seven years of recovery (right panel)—still a marked reduction in neurons. 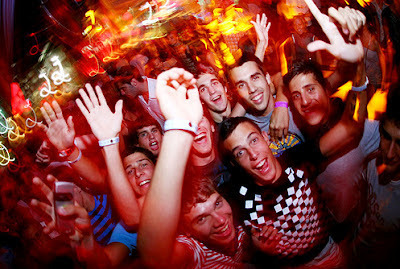 Short-term physiological effects of MDMA include increased heart rate, blood pressure, and body temperature; blurred vision; sweating; loss of appetite; nausea; and jaw-clenching. Overdose can cause paranoia, hallucinations, hemorrhage, fainting, and organ failure. Sure sounds like "ecstasy" lives up to its name, right? 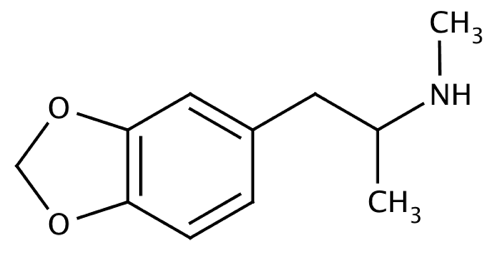 Currently, clinical trials are testing the therapeutic potential for controlled MDMA in anxiety disorders such as post-traumatic stress disorder (PTSD) and the anxiety associated with terminal cancer. 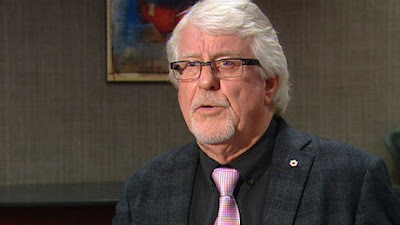 Dr. Kendall's statement comes after a string of 16 death in British Columbia since last July associated with a tainted batch of ecstasy containing the toxin PMMA. The health official wants to explore legalization of the drug, asserting that he is "quite a strong critic of prohibition" in that it doesn't do "much to reduce harmful use" or put "billions of dollars into the hands of criminal enterprises." On a socio-economic level, he has a point. But...safe? 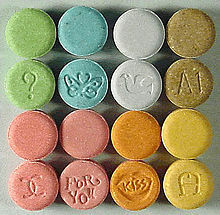 Ecstasy is safe? Let's make sure citizens are getting the facts before we tell them what they want to hear. Photos courtesy Bassam Loucas, Wikipedia, Drugs Forum, and CBC. Video courtesy pushthefire (YouTube).